Check here for important updates and announcements from Peace it Together. After almost a year of organizational self-examination, community consultation and stakeholder engagement, Peace it Together is proud to share its new Strategic Plan, "Learning to Lead: Grounding peace work in action and change." In addition to illustrating our comprehensive theory of change, and describing our short-term and long-term goals, "Learning to Lead" contains a new exciting and ambitious vision for Peace it Together, as well as a new set of guiding principles that explain our approach to peace building work. "Learning to Lead" demonstrates Peace it Together's progress as an evolving and responsive peace-building organization, and lays the foundation for Peace it Together to offer our most comprehensive and impactful programming yet. We are pleased to announce we have begun a search for a Co- Executive Director to join Reena Lazar in leading the work of Peace it Together. Returning to a joint leadership model is an exciting change that will have a positive impact on our next cohort of youth, set to begin a new dialogue, filmmaking and community engagement program in the summer of 2014. Moreover, we think this will best position Peace it Together to foster meaningful relationships with both Palestinian and Jewish/Israeli communities, in the region and around the world. It has been incredibly rewarding serving as Peace it Together''''s sole ED for the past four and a half years," said Reena Lazar. "Now I am looking forward to working with a partner again." Reena, who identifies as Jewish, added that the organization would benefit from another leader with different - yet complementary - perspectives, experiences, and relationships from her own. Background: Over the past year, staff, board and other stakeholders have been working hard supporting our youth as they screen their films, facilitate creative workshops and foster dialogue in their communities. At the same time, we have been developing a new Strategic Plan and exploring how to strengthen our work even further. In this new Strategic Plan, we identify the need to pursue equitable representation of the communities we serve as a top priority. Hiring a Co Executive Director with strong ties to Palestine and the Palestinian diaspora is an important first step towards making this commitment a reality. the ability to work on serious issues while fostering a creative and open workplace infused with commitment and possibility. All four of these special films were made by 2011 Canadian youth participant Tim Hall, with support from Peace it Together staff, other youth from the 2011 Canadian delegation, and many others. To see the complete credits for these films, click here. Mark your calendars! 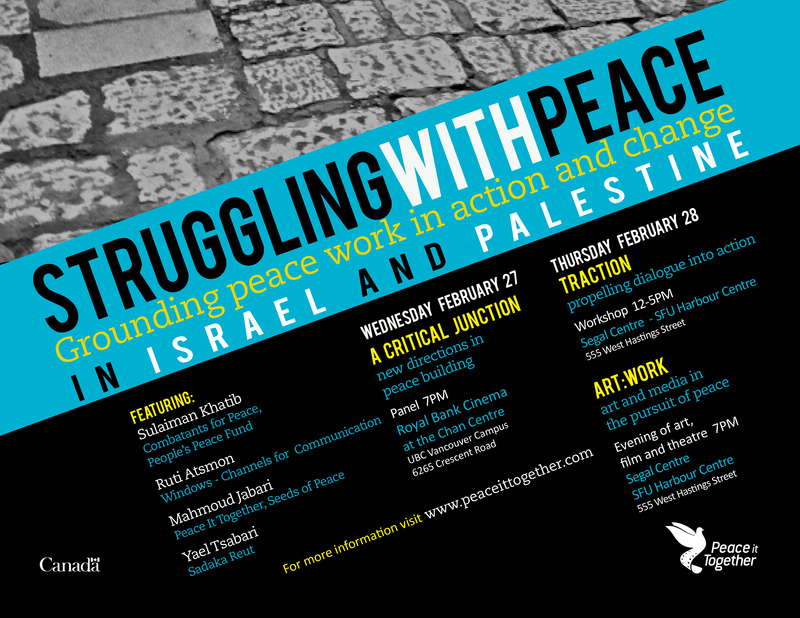 Peace it Together will be hosting renowned peace builders for a special two-day symposium Feb 27-28, 2013. During Struggling with Peace: Grounding peace work in action and change, audiences will have the rare opportunity to engage with a panel of prominent peace builders and activists from Israel and Palestine, participate in a creative, hands-on workshop led by these renowned facilitators, and immerse themselves in the experience of creating art as a tool for peace building. Statement from Peace it Together: Last week all of us here at Peace it Together heeded the news of a ceasefire in the Gaza strip with relief and caution. After eight days of the most intense fighting in the region since 2008-2009, we were grateful an agreement had been reached that would put an end to any further loss of life, injury, trauma, and displacement. Statement from Peace it Together: Peace it Together has long been concerned with the wellbeing of those living in Israel and Palestine, and the fact that violence has been an everyday reality for some. With the recent escalation of violence in Gaza, and Southern and Central Israel, Peace it Together is now particularly concerned about the safety of all those throughout Israel and Palestine. Peace it Together is proud to announce that five films from the 2011 program - Movement, In the Presence of Absence, Spectrum, Grave Digging and Through a Glass, Darkly - have been selected for the BolderLife Film Festival. 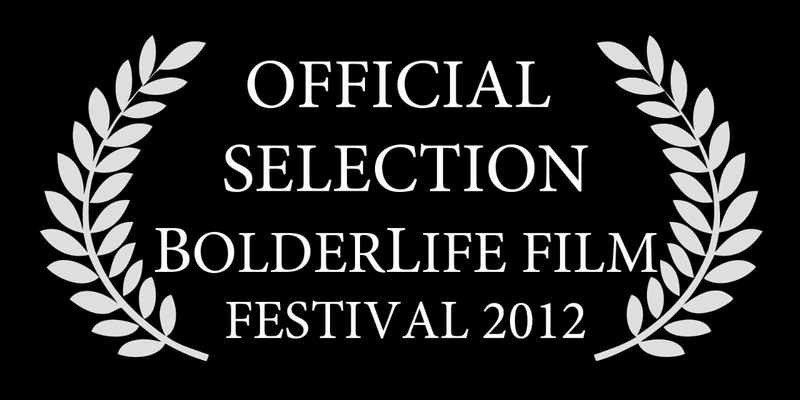 The festival will be held in Boulder, Colorado from September 20-23, 2012. Exact screening dates and times are to be announced.